Crearé Web Solutions built an image-based website that plays with full-screen black & white images and uses a pop of color to indicate different sections as you browse through the website. A mobile friendly, unique website that presents all the information about Voice Communications’ services in a clean, well-designed manor. 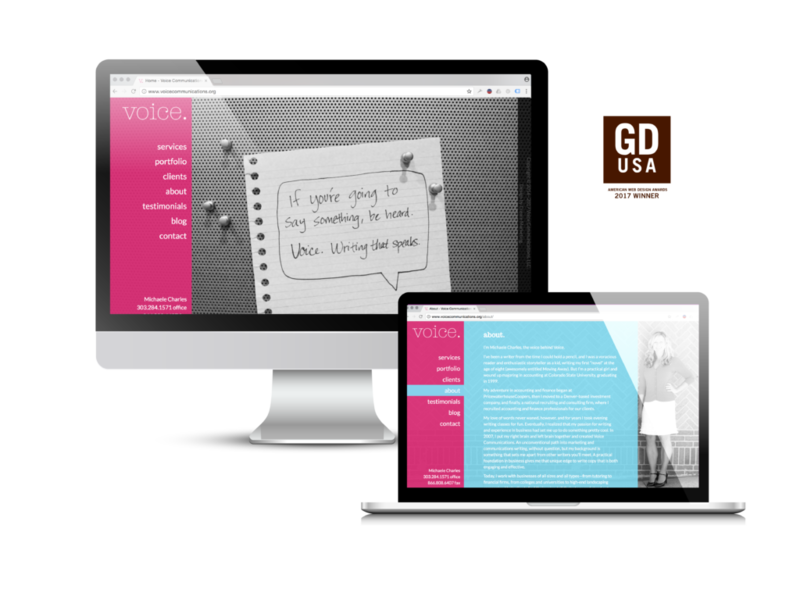 And, most exciting of all, it won a GD USA award for best website design. I had hardly touched my website for six or more years prior to engaging Crearé Web Solutions. It was outdated from a content perspective and not mobile friendly, and I needed a total overhaul to better reflect my portfolio of work and the writing services I provide to my clients today. Brianna and Nic are one of the best web design teams I’ve worked with—and I have worked with many. They’re knowledgeable and easy to work with and asked the right questions to help bring my vision to life. As a marketer myself, I knew what I wanted to achieve, and they knew how to execute it. I recommend them for their timeliness, deep knowledge of all things web, reasonable pricing, and overall friendliness as people. If your goal is to create an impressive, optimized website that makes an impact, Crearé is an excellent choice.